Home » Post » What's New? 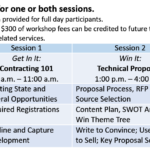 Government Contracting – Get In It to Win It! Q10’s President, Linda Cramer, and partner from Echo Logistical Solutions, Steve Renz, will be discussing government contracting on 1110 AM with Chris Kettner. Chris runs the nationally syndicated radio show, The Specialist Radio Hour.